The Elliptical T Bar 3 Ring is a 45 mm lozenge, it is stronger than the Control Plate. This is due to it having a smaller surface area. Consequently, a horse using his tongue as a means of pushing against the bit and therefore taking control, will draw back and tuck his chin in, coming back to a better point of control. The T-Bar was developed by Bomber for Polo, it will have the same effect as the traditional Fulmer. This is because it will prevent pinching on the sides of the mouth. 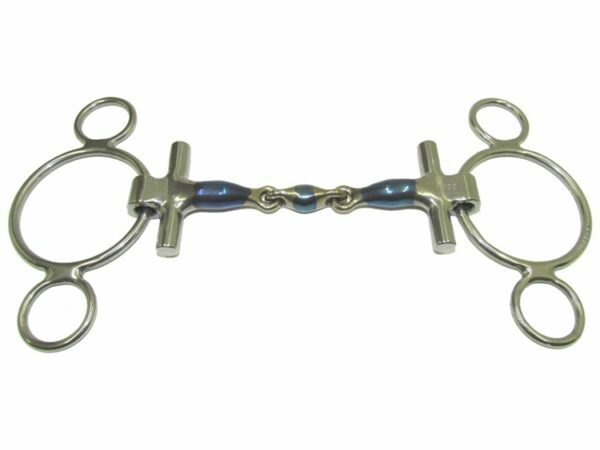 However, the shortened and extended pins above and below the bit prevent the bit firstly being pulled through the mouth and secondly has the effect of guiding the horses head into the direction the bit is facing which is great for schooling and training purposes. The T-Bar has a Loose Ring fitting which allows for immediate release whilst the shortened pin extensions prevent it from being hooked up.